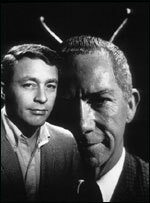 My Favorite Martian was a weekly situation comedy that ran for three seasons (the first two in black and white, the third in color) in 1963–1966. It began with reporter Tim O'Hara (played by Bill Bixby) rescuing the pilot of a crashed flying saucer (Ray Walston), an anthropologist whose speciality is Earth, and passing him off as his Uncle Martin, all the while trying to write the story. The chief complication is keeping Uncle martin's identity secret and his powers (invisibility, telepathy), along with his antennae, under his hat. Generally popular in its time, My Favorite Martian combined gentle comedy with broad satire. · Directed by Oscar Randolph, Sheldon, Leonard, and others. · Written by Ben Gershman, John L. Greene. · Regular cast: Ray Walston, Bill Bixby, Pamela Briton, Alan Hewitt, J. Pat O'Malley. The first two seasons of My Favorite Martian were filmed in studio space leased from Desilu. The third season was filmed at MGM because Desilu needed the studio space for a new television series – Star Trek. Ray Walston himself went on to play the character of Boothby, head groundskeeper at Starfleet Academy, in Star Trek: The Next Generation and Star Trek: Voyager.